Exciting new stallion A.P. Answer(USA) standing at Clifton Stud has just produced his first crop of foals, but his arrival at the farm was an interesting story – that the delete button on Peter Blyth’s keyboard almost prevented this eye-catching bay stallion by A.P. Indy from even arriving in the KZN Midlands. A.P Indy is the sire of current sire-sensation Bernardini who has been in the news recently. His first crop, now four year olds, include four individual Group 1 winners. Zenyatta is due to foal to him very soon and has been rebooked back to him for the next season, along with Rachel Alexandra and Blind Luck. “We did a trip to the USA to see the Kentucky Derby and some stud farms in Lexington back in 1998. At Lane’s End Stud, we saw A.P. Indy and I was blown over by him,” Peter recalls. “He was absolutely beautiful. He was a $2,9 million yearling and a top racehorse. 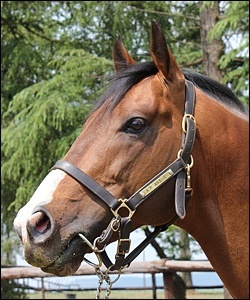 “At the time we stood Allied Flag (also bred at Lane’s End) and from him we bred ‘Horse Of The Year’ Classic Flag, the record-breaking winner of the 1998 Durban July. Allied Flag was by Danzig and I have always been a huge fan of Danzig. “Coincidently at the time, two of A.P. Indy’s Gr 1 winners were Run Up The Colors, a half-sister to our Allied Flag and Tomisue’s Delight who won or placed in five Gr 1 events in 1997. She was out of Prospector’s Delight (by Mr Prospector) another half-sister to our Allied Flag. Now, importantly to note, subsequently they put Prospector’s Delight to A.P. Indy and got the now very successful sire and four times Gr 1 winner Mineshaft. I could not wait to get back to tell my fellow shareholders in Allied Flag, that we should buy an A.P. Indy as our Allied Flag daughters should go very well, by what was already proven in the USA. “At Claiborne we saw both Danzig and Mr Prospector. They were both near their ends but to see and touch these two world famous horses was incredible and a moving experience. While there, we stood at Secretariat’s grave. Secretariat had made such an impression on me when I was a youngster. We also stood at Bold Ruler and Buckpasser’s grave – two world famous sires. “We also saw Seattle Slew at Three Chimneys, where he stood – a champion [1977 Triple Crown winner] and sire of A.P. Indy – and he bowled me over. Then at Ashford stud we saw Storm Bird. Storm Bird is a top sire, being the sire of Storm Cat, amongst others and his mother South Ocean is the fourth dam, along the bottom of A.P. answer’s female line. 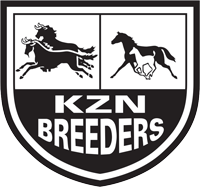 “I wasn’t shopping for a stallion, having moved to KZN, but agents were still emailing me prospective sires. I would just look and delete the emails after glancing at them. When A.P Answer’s pedigree landed on my computer, all of the horses I had seen in the States was in this pedigree. A.P. Indy, Danzig, Mr Prospector, Seattle Slew, Secretariat and Storm Bird’s mother, Bold Ruler and Buckpasser. It was like an omen!! By A.P. Indy out of a Danzig mare, I couldn’t believe it. So instead of deleting it I just closed it. The next day I couldn’t help having another look. I hadn’t done any research but I could see this was a helluva good pedigree. A.P. Answer stands just under 16.1, “I think that he is a good looking horse, a racy looking horse with Danzig definitely coming through,” Peter says. “Sadly he damaged his knee and couldn’t produce it on the track as a result. People like the look of him and he has a good temperament. He has produced very nice foals – they are racy, scopey horses, and they are good looking. 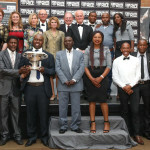 Most of the KZN breeders bought shares in him and he has been well supported thanks to them all. A.P. Answer has an incredibly strong dam-line, with the essential Gr 1 winners or placers under each of the dams going back four generations, that sires must have in their female lines. Pas de Reponse, his mother, was a champion 2 year-old filly with five wins in England and France, which include the Gr 1 Cheveley Park Stakes and 2nd in the GR1 Prix de l’abbaye de Longchamp, then third in the Prix Morny Gr 1. Her two brothers, Sunday Doubt and Saying are both Black Type winners too. The second dam Soundings, also produced Green Tune (by Green Dancer) who was himself a Champion 3 Year Old Colt in France winning three Grade 1 races. As a sire he produced Gr 1 winners. Unfortunately he died prematurely at stud, breaking a leg in the paddock, but he got another Stakes winner, a Grade 3 in America last week. He has produced over 16 Stakes winners to date. Under the third dam Ocean’s Answer, amongst a number of Stakes’ winners, is A.P. Warrior, sired by A.P. Indy. “A.P. Indy onto this female line has already produced A.P. 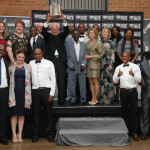 Warrior who is already proving as a sire, he is now siring winners,” Peter explains. A.P. Warrior is the Stakes winner of the Gr 2 San Filipe Stakes, Gr 2 La Jolla Handicap and has placed in five Group races, including the Grade 1 Santa Anita Derby. He is standing in Florida and he is kicking off pretty well being the top sire of 2 Year Olds in 2011, having over 14 winners including two stakes winning horses. Just yesterday Thunder Moccassin, a son of A.P. Warrior, won the Grade 2 Hutcheson Stakes by six and three quarter lengths at Gulfstream Park for three year olds. He is out of a Storm Cat/Devil’s Bag/Nijinsky mare. Under the fourth dam – the famous South Ocean, we have none other than Storm Bird, 13-time winning daughter of Northern Dancer called Northernette who went on to produce Grade 1 winners. More horses include Grade 1 producing sire Signal Tap another sire who won the Grade 1 Hollywood Turf Handicap, Storm Trooper. Storm Bird was Champion 2 Year Old colt in his day, with 4 of his 5 wins being Group races. 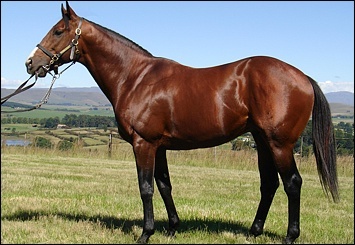 He is also the sire of Champion Stallion and number 1 Sire-Of-Sires, Storm Cat, who commanded a stallion fee of $500 000 for a service prior to his retirement. He has left a world-wide legacy with the likes of Giant’s Causeway. A.P. Answer covered 118 mares this past season and 123 the year before. He is so fertile and relaxed and does not fall away, which allows for this many. Peter has so much faith in the stallion he has sent his best mares to him including Vogue, True Lily, Kali Mist, Love Leah and Fiesta Fiesta. He has also covered Vogue, by Model Man out of the brilliant broodmare Thousand Nights. “Last year I sent Vogue back to Fort Wood again, and this year I have put her in foal to A.P. Answer. 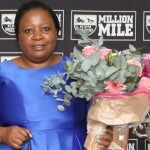 That’s a good mare.” The mare in question is the dam of Fort Vogue (sold for R2,2 million at 2007 National Yearling Sales), who sadly passed away in Dubai recently. He covered True Lily – by Joshua Dancer out of Tritonia winner of 6 races – from the wonderful ‘Lily’ female line. She has two previous foals by Black Minnaloushe and a yearling by Fort Wood. He has also covered the dam of The Plunderer, Love Leah. She is by Restructure out of Venetian Lily and foaled a Fort Wood last year. The Plunderer won the Champion Juvenile Cup Grade 3. His dam went to A.P. Answer this year, she is also from the Lily female line. Fiesta Fiesta (National Assembly – Festive Forever) was another mare used, a half-sister to Fearless (Equus Champion 2 Year Old colt in 2006) and she has a filly by Western Winter. Fearless was unbeaten, won 3 and then there were complications getting him out to Hong Kong where he went to David Ferraris. He won the Grade 1 Golden Horseshoe before he left and has had 3 wins in Hong Kong. For extended pedigree and information on A.P. Answer click here. Should you wish to contact Clifton Stud, please phone Peter 082 456 3489 or Jenny on 033 267 7407 or alternatively email blyth@cliftonstud.co.za.